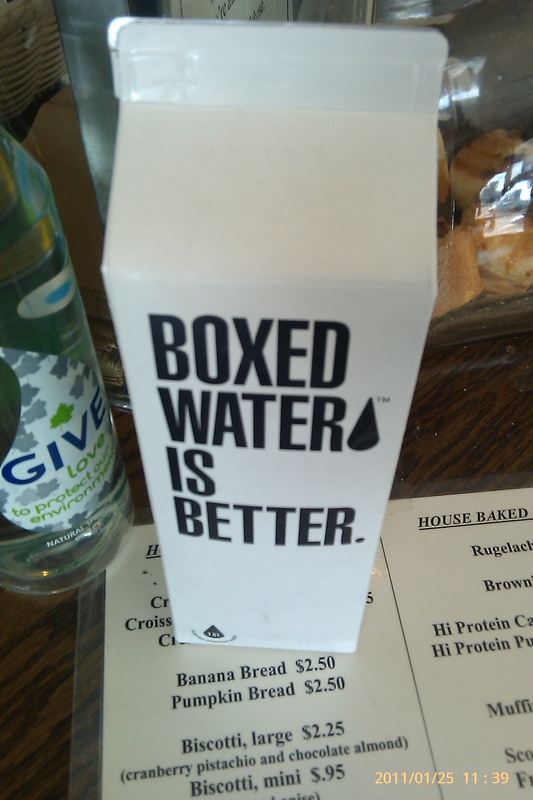 L.A. the Blog: WTF is Boxed Water? Straight from Grand Rapids, MI comes the newest in useless products, or gimmicky marketing ideas, or possible just plain stupidity. Yes, it is Boxed Water Is Better. WTF is Boxed Water you ask? Supposedly it is better. The box says it is purified water and I am sure that it doesn’t taste better than spring water, at least not as good as Fiji water, but maybe it does. It isn’t in a plastic container and that for sure is better. 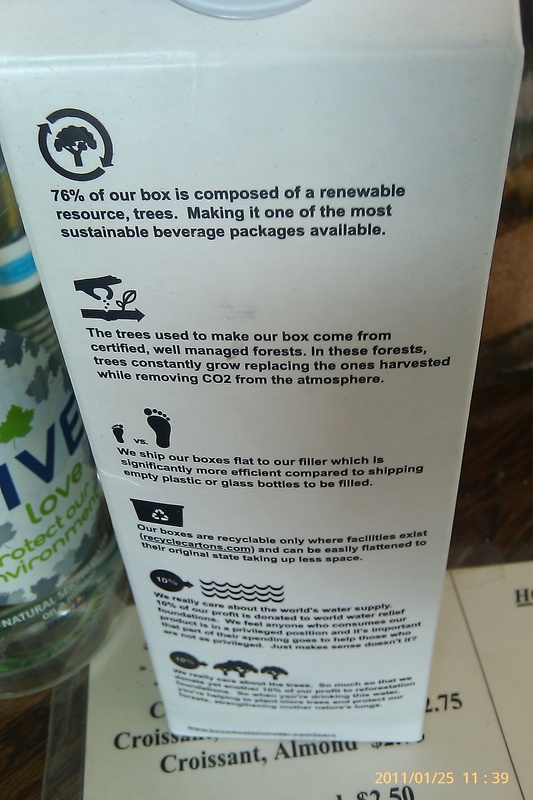 It even claims that 76 percent of the box comes from trees! Genius! Though we seem to be killing trees all over the planet faster than we can replace them … maybe not so good. But in turn if you go to the Boxed Water Is Better website you learn all kinds of neat stuff. Like they donate 10 percent of their profits to reforestation foundations, and 10 percent to world water relief foundations. Do they list which ones on the website? No, but who cares they are giving. They have been selling the product since 2009, and almost a year later it surfaces in Los Angeles. The product is recyclable … but only if your city has stupid box carton recycling plants. Sorry New York City you only recycle profitable items, and boxed cartons don’t count at all. The website claims carton recycling is growing. Hurray! Except if you follow the links to find out if your community recycles the link doesn’t work, booooo. Well, don’t worry Los Angeles for the record we don’t recycle boxed cartons, follow this link to find out what L.A. recycles. So maybe boxed water isn’t better. One person when asked thought the best container for water equals glass. Glass is recyclable. It comes from renewable resources. You don’t have to kill poor trees and that makes the vegans happy … dope! Well in defense of boxed water, it is easier and cheaper to ship cartons than glass. That means bottled water might cut down on costly fuel waste. So mark one up for boxed water. Most likely Grand Rapids, MI manufactures box cartons and they have way too many on hand, so they boxed up purified tap water to sell with the cartons. That way they got rid of their stupid boxes. They then created this funky marketing ploy. Okay maybe too much conspiracy. And then straight from Boxed Water’s website it says, “Part sustainable water company, part art project, part philanthropic project, and completely curious.” So in reality it is another f’n hipster art project … sad. Update: So L.A. the Blog realized it never got the price for this phenomenal marketing attack. $2.50 for a box of water, so you can not save the environment with this non-recyclable product while at the same time lose all your money … do yourself a favor, buy glass bottles. This entry was posted in Art, Food, Los Angeles, Marketing and tagged art, Boxed Water Is Better, L.A. the Blog, marketing, products. Bookmark the permalink. I bought a Boxed Water in the courtyard cafe at LACMA and was bemused that it was handed to me at room temperature, but did not complain since I had also ordered an Italian Soda on ice. 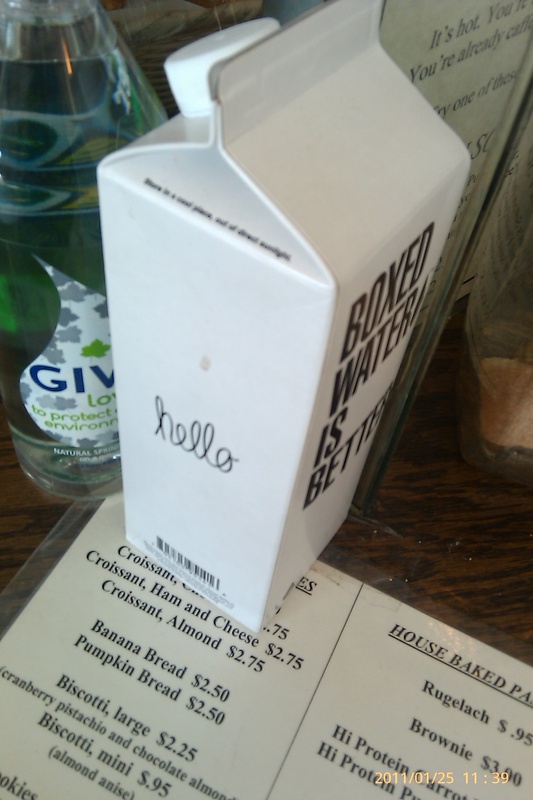 Where in LA did you find this boxed water? We originally found it at a coffee shop I believe in Hollywood, but I see it every now and then on various stores and restaurants.